For most foreign visitors who come to Taiwan for their first time, an itinerary example would be helpful and save lots of your time. 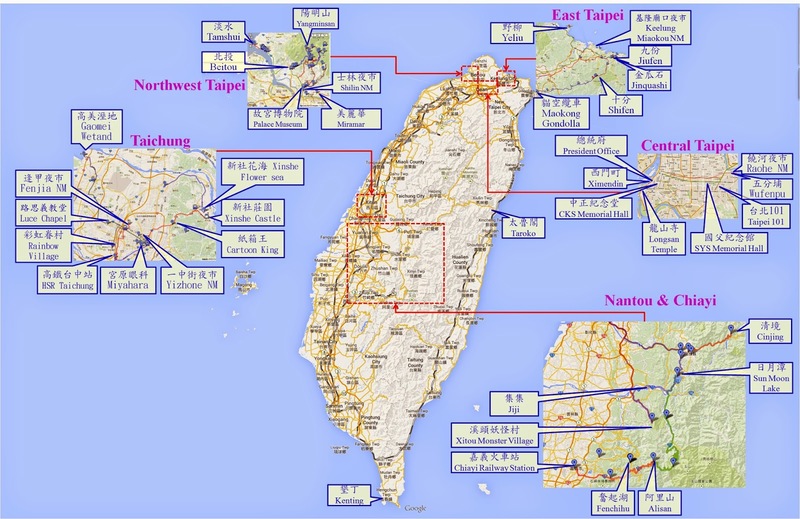 There are area itineraries for different areas, and multi-day itineraries for your Taiwan trip. When you finish this article, you may prepare your own itinerary by yourself. It is easy to choose places of interest when you want to travel abroad. No matter from the net or guide books, you can find lots information that introduce the places of interest in Taiwan. However, it may be difficult to find the information that focus on public transportation and itinerary. You have to figure out the location of places of interest. You need to find the information of public transportation or cab that meet your need as well. Lots foreigner visitors start their itinerary arrangement by taking other itineraries as reference. There are 2 types of itinerary examples.. The area itinerary focuses the trip within certain area, including Northwest Taipei, East Taipei, Central Taipei, Taichung, Nantou & Chiayi. You can find more information from other blogs (e.g. time table, maps, attraction nearby, etc). Most area itineraries are one-day trip, some area itineraries take 2~3 days. Taiwan Itinerary Examples provides itinerary examples of different days.. You can check the brief introduction and fine the Taiwan itinerary that are closed to your need.Using the area itinerary, Taiwan itinerary combines different area itineraries. You can find the information of public transportation that connect different cities. There are some notices you should know before reading the itinerary examples. The places of interest in the itinerary examples come from the most asked questions in the forums of tripadvisor, backpackers and lonely planet. The major transportation tools in the itinerary examples are bus/train/ HSR. You can take cab since some places of interest are located at remote districts that few public transportation tools can reach. Or you can save a lot of time but pay a little more. When there are children or seniors, you can also consider hiring a cab for whole day. Since the itinerary examples cannot be updated immediately if there is any change in the timetables of train/bus/HSR, you should check the time tables when organizing your own itinerary. The itinerary may change according to the seasons or festivals. The flower seasons in Yangminsan is between February and March and November in Xinshe. The hot air balloon festival is between July to Auguster. You can check the flower seasons and festivals in Taiwan. You itinerary will be more interesting if you can join some seasonal activities. 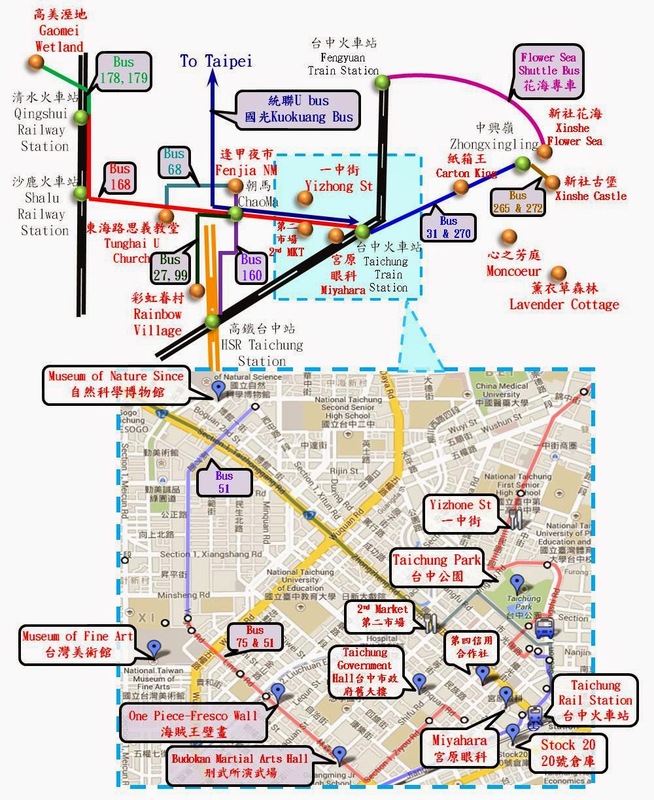 For more information (maps, bus lines, attractions) regarding to Tamshui, Beitou and Yangminshan, please refer to Yangminsan,Palace Museum,Beitou, Tamshui, Shilin NM Itinerary. 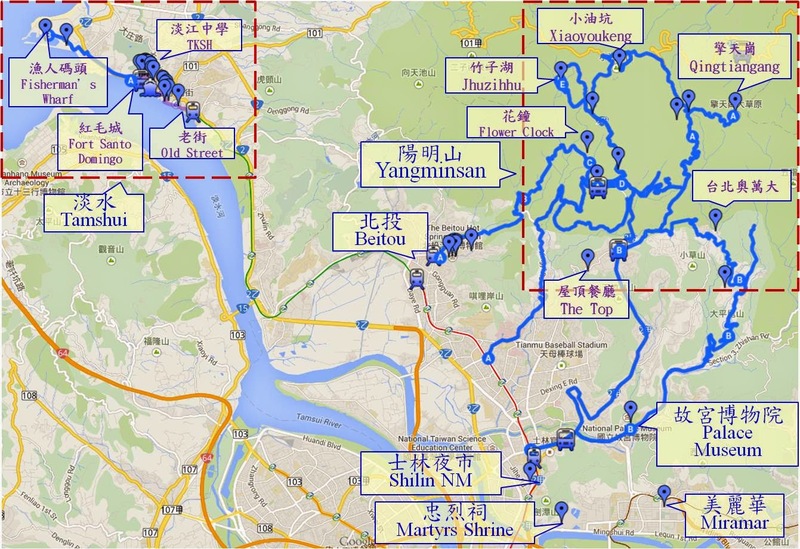 Tamshui, Beitou, Shilin Night Market, Palace Museum, Yangminsan are loacted at northwest corner of Taipei. Except Place Museum, you can take MRT to these attractions directly. The itinerary TPE_NW_2 focuses on Yangmingshan shuttle buses. You can choose the attractions according to seasons. For example, Feb~Mar is the season of cherry blossom and you can go to Flower Clock. Mar~Apr is the season of calla lily and you can go to Zuzhihu. TPE_NW_3 is a counterclockwise itinerary and you can enjoy the sea view of north coast when you take the bus from Yeliu to Tamshui. 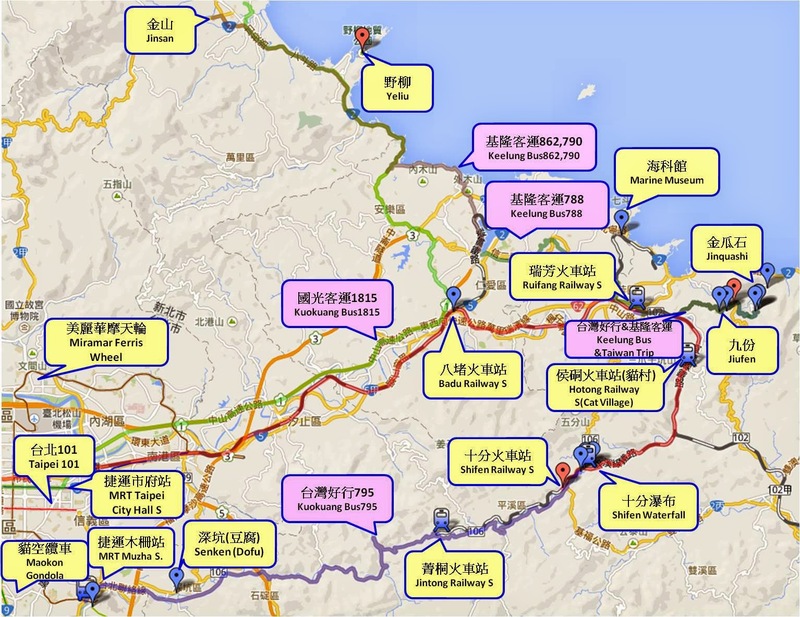 For more information (maps, bus/train timetables, attractions) regarding to Shifen, Pinxi, Jiufen and Yeliu, please refer to Transportation of Yeliu, Pinxi, ShiFen & JiuFen. Jintong, Shifen(Waterfall),Hogong, Jiufen, Jinquashi and Yeliu are located at east corner of Taipei. Here is hill area and the bus/train frequency is lower. The following itinerary examples are arranged according timetable of train/bus. Since Yeliu is away from Taipei & Jiufen and the bus frequency is low, it take a lot of time if you want to go to Jiufen after Yeliu. You don't have chance to go to Keelung Maokou Night Market either. You can go to Taipei 101 in the morning and take Bus 1815 to Yeliu from MRT Taipei City Hall Station after lunch(TPE_E_4). Around Taichung Railway stations, most attractions in Taichung located in East Taichung(Xinshe Castle, Carton King, Moncoeur, Lavendar Cottage, etc), West Taichung(Gaomei Wetland, The Luce Chapel, Rainbow Village, etc) and Central Taichung (Miyahara, Yizhong St, Fenjia Night Market, , Second Market, Taichung Opera House, Calligraphy Greenway). Since HSR Taichung is located urban area of Taichung and it take about 40 minutes to Fenjia Night Market, in which lots hotels, You may take bus to Chaoma, the first bus station when the bus arriving Taichung, and take taxi to Fenjia Night Market. Comparing to HSR from Taipei, bus takes you only 1 hours more, but bus save you about NTD 500 and you save the time between HSR Taichung Station to Fengjia Night Market. You can go to the attractions in Central Taichung by bus. The bus is free within 8km if you use EasyCard. You need to transfer Gaomei Wetland and the bus(178,179) interval is 1.5h~2.5h if you take public transportation. For more information (maps, bus/train timetables, attractions) regarding to Alisan, Cingjin, Sun Moon Lake, Xitou, please refer to Transportation Between Cinjing, Sun Moon Lake, and Alisan. Cingjin, SML & Alisan are must-see places for most foreign visitors. It is a pity that lots travel information do not mention the mountain view between Alisan & SML. The itinerary NC_2 take Alisan Forest Railway to Fenchihu in the morning and take bus to Alisan in the afternoon. Then take bus 6739 to SML in the afternoon of D2, You can take the forest train from Chiayi to Fenchihu and arrive Alisan in the afternoon. The itinerary NC_3 goes to Cingjin, SML and then goes to Alisan. May I know what do all the Ds stand for? namely D1-1/D2/D/D4? That's Day1, Day 2, Day 3, Day 4. Hi, am planning to head to Hualien for Taroko Gorge from Kenting and later to cover He Huan Shan, SML and Cingjing Farm. Instead of going from Taichung, what will be the best way to travel from Hualien to cover the 3 places mentioned and end at Taichung? Since it is not a bus line, the tour company may cancel it.Please confirm with the tour bus company. Hi! i will travel in April 2017 with my mom and planning to do a day trip for Tamsui Fisherman wharf - Yangmingshan - Yehliu - Keelung Night Market then going back to Taipei, is this doable? I stay nearby DAQIAOTOU MRT station and plan to catch the ferry around 7.30AM monday, is this more easy and fast to reach Tamsui fisherman wharf by ferry from 大稻埕碼頭? If by ferry, is the stop at Tamsui called Fisherman's wharf? how long is the ferry journey? 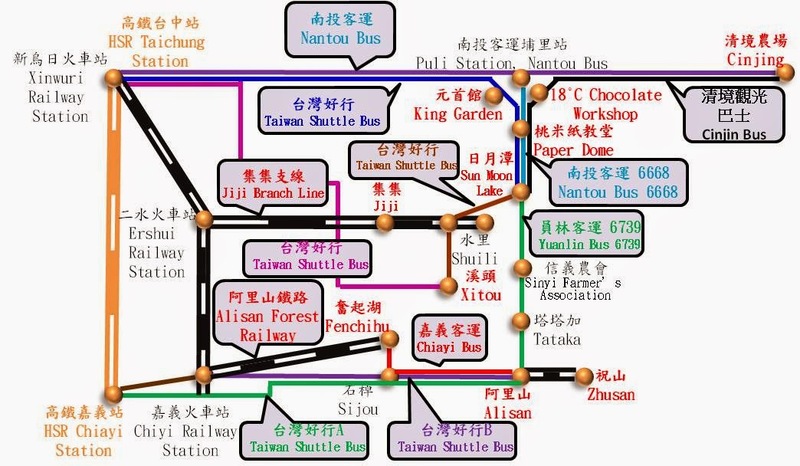 How to reach Yangmingshan from Tamsui MRT station? is it better to take taxi from Tamsui MRT? How much is the taxi fare if i may know? How long is the journey to Yangmingshan and how long should i spend there? What is the best scenery there? i heard yangmingshan is quite huge areas, i try to avoid hiking trail if possible, and you mention zuzhihu and flower clock is worthed to visit. How to go there? How to reach Yehliu geopark from Yangmingshan? i heard need to take bus, is there any specific bus number and where is the bus stop in Yangmingshan? Does the bus "stop" exactly in front of Yehliu geopark there? is the distance between mushroom rock, ginger rock, candle shaped rock, honeybomb rock, etc are far from each other, or by walking distance only? How to go from Yehliu geopark to Keelung night market? is there any specific bus and bus stop nearby Yehliu geopark? Or taking taxi will be better? How long and how much it cost? 8. Then, from keelung night market to songshan MRT, is it taking bus 1803 (Keelung-Zhongli) , stop at Nanjing apartments then wait for bus 204 to stop at Songshan station, so can go back to Daqiaotou MRT station? 2. It is almost one-day itinerary. 2h is only enough for old street. 3. If you mean Zhuzihu, you can take MRT to Beitou Station and take mini 9 (About NTD 45). You can take taxi (about NTD 650)as well. 6. No, about 850 m between the bus stop and the park. just checking if it is possible to do Hualien, Alishan and SUn moon Lake together within 5 days? It is doable for 4 full days. NC_2 3 Days for Alisan & SML. One day trip to Hualien from Taipei. TPE_E_1 2 and 3 unable to open. Can you see other itinerary examples? Since the PDF itinerary examples are stored google drive, you cannot see it if you use your office PC/NB with security software. Hello, I'm planning to go to Taiwan in April? Is it worth to get the 5 day train pass or not? I want to go from Taipei to Alishan to Kaoshing back to Taipei. What do you think? thanks!